Happy day-after-Valentines! Poor February 15th never gets any lovin'. But I have had one solid day of sewing, and I worked to finish my For the Love of solids big item. I've decided to leave the quilting as is, without adding any more to it, because I would hate for it all to be overwhelming. Today's plan is to take the last few steps to turn it into a pillow cover. I also finished my small item for the swap [the deadline isn't until March, so I feel very pleased with myself that I'm so ahead of the game!]. The cross-stitch was so well-received that I took my pencil-and-graph-paper-scribbles and used a professional cross-stitch program to turn it into a pattern. I included the DMC floss numbers that I used, as well as a page of basic cross-stitch instructions and tips that I have for this specific pattern. I think it's an excellent pattern for a beginner and has a younger feel to it. So it is posted for sale in my Etsy shop for $3, which gets you a photo of my finished product, the pattern and stitch key, tips, and basic cross-stitch instructions, all in PDF form via email. [I like to download it to my phone and stitch at coffeehouses]. So consider getting one for yourself for your fabric stash/wall decoration, or for a friend with cheeky humor! Ok, does anyone else think of Tom Selleck when they think of mustaches? Just me? Alright. We were doing this at 11 pm, hence the bad lighting. And finally, to hopefully bring a smile to your Wednesday, my other fabric project this week was to help my little sister make some valentines. She's editor of her school paper, and likes to keep morale up [they often stay late into the night when the paper goes to press] by giving her staff food. 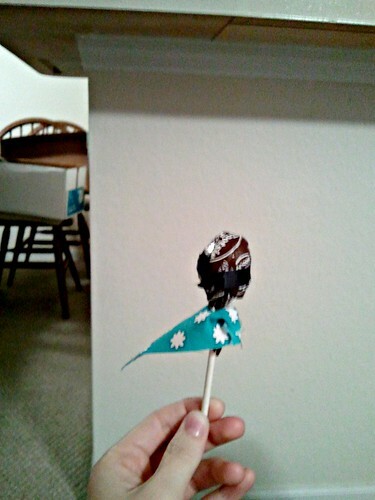 So she found an idea on Pinterest for lollipops made into superheroes. The original photo used cardstock and printed templates for capes and masks. I said, pffffftttt, we can use fabric scraps! So she raided my scrap bins and cut the pieces to size and I cut a little slit to slide the fabric up the stick and then hot glued the front to sort of look like the cape was tied around the superhero's "neck". I also burned my fingers a bunch, but that part is not in the instructions. 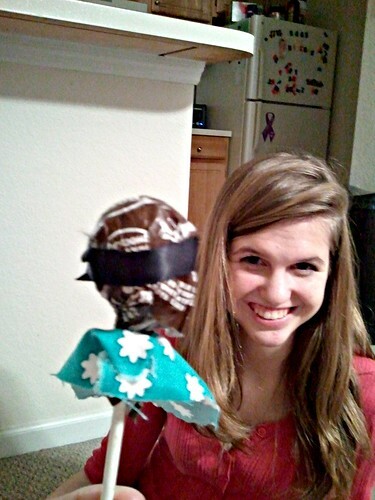 Then we tied black ribbon to be the "masks". At home she added "Have a super day" to finish these little cuties up! And now, to finish my non-sewing WIP of the day...laundry. Ew. **Edited: I'm also linking up at Crazy Mom Quilts for Finish it up Friday since my hoop art was a finish! And, because I like to keep it real, I didn't finish the laundry. In fact, there's piles of clean laundry that need to be folded/hung up and I've been avoiding eye contact with them. I thiiink that if you do that long enough then the laundry fairy rolls around and takes care of it, yes? So cute! I always think of Tom Selleck - I told my husband he can only grow a moustache if it's as good as his haha! The cross stitched turned out so cute! 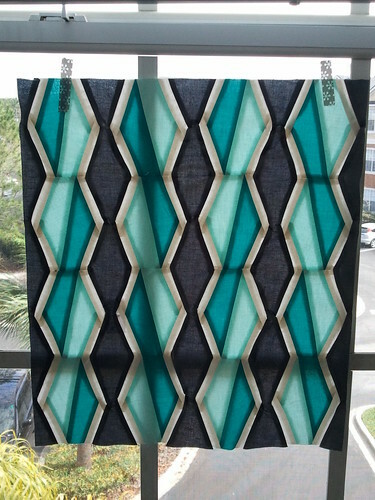 I really like your solids quilt! Great job! 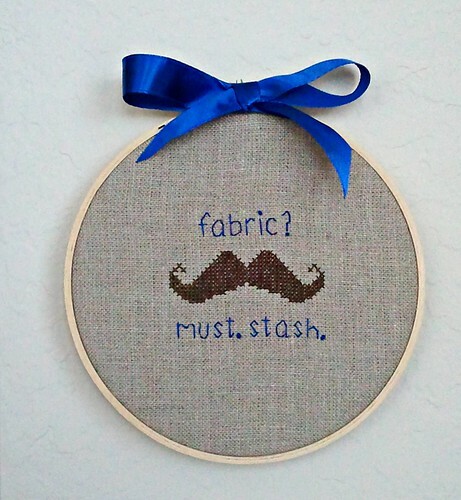 My sister loves mustaches, but doesn't sew or have a fabric stash. I will have to think of someone else who needs the cross stitch in their sewing room, it is really cute. LOVE your cross stitch! Absolutely adorable!! Awesome cross stitch! Go you! And I TOTALLY think of Tom Selleck (Magnum PI!) when I see the mustache too :-) Fun to meet you over at WiP!! Nice quilt!! 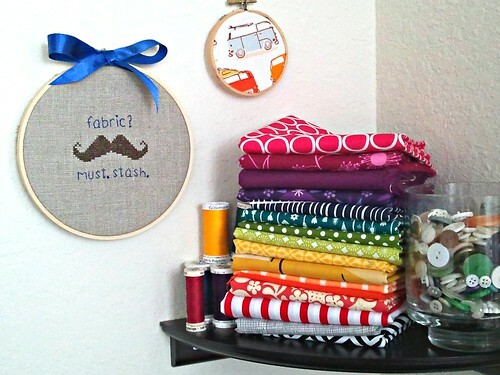 Love the little superhero pops... my favorite is that pile of fabrics in the background of one of your pics - yummy!! !